Among the Waxbills (Family Estrildidae) we find some of the most popular of all cage birds, most of which are referred to as “finches”. The related Weavers and Whydahs (Family Ploceidae), less commonly kept, are valued for their unique breeding and nest-building habits. Oddly enough, only a few species of True Finches (Fringillidae) have actually made their way into finch collections. Waxbills are known for their extremely colorful plumage, but even the somberly-clad species are marked with interesting patterns. 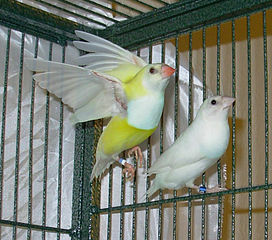 The Gouldian Finch and Cordon Bleu sport a fantastic array of bright colors, and are well established in the pet trade. Bengalese and Zebra Fiches, captive bred for thousands of generations, are considered to be fully domesticated by many ornithologists. The Zebra Finch has been dubbed “The Avian Lab Mouse”. Zebra Finch studies have led to a wide array of important discoveries bearing on human health, genetics and behavior. Many Waxbills forage in huge flocks, within which they move, feed, preen and bathe in a highly synchronized manner. Linked by both visual and vocal signals, flock members appear to move as a single unit. Waxbills form strong pair bonds which are often maintained year round. 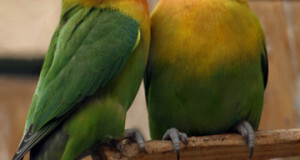 Pairs remain in close proximity even within flocks containing thousands of individuals. Waxbills generally breed at the start of the rainy season, and their chicks are an important food source for a wide array of reptiles, mammals and raptors. In many populations, less than 20% of the fledglings reach adulthood. The chicks of species that nest within tree hollows and other dark locations bear luminous patches on the tongue, palate and/or bill, which apparently assist the adults in feeding the nestlings. 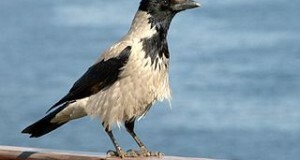 Four subfamilies of Weavers are recognized – the True Weavers, Buffalo Weavers, Parasitic Whydahs and Sparrows. This group contains some of the avian world’s most accomplished nest-builders. Largely confined to Africa, many species use highly complex knots to create enclosed nests that can only be entered from below and after negotiating a 2-foot-long tunnel. Positioned at the very tips of tree branches, these unique nests confound most predators. Most True Weavers are extremely choosy when selecting nesting material. Red Bishops that I cared for would accept only green beach grass presented in clumps. The same grass offered on a tray was rejected, as were similar (well, similar to me!) grass species. The Red-Billed Quelea is believed to be the world’s most abundant bird…a single flock may number over a million individuals. Whydahs lay their eggs in the nests of Waxbills and provide no parental care. Males copy the songs of the birds they parasitize, and the luminous markings on the bills of their chicks mimic exactly those of their hosts. Eight Sparrow species are closely associated with humans, and nest on or near their dwellings. The widely-introduced House Sparrow, well-established in the USA, rarely strays far from human habitations. The ground-dwelling Snow Sparrows nest at some of the highest altitudes – to 15,000 feet above sea level – of any bird. Please see my upcoming blog “Finch Facts” to learn more about other popular cage birds. Cordon Blues often nest near wasp colonies. Please see Nesting Associations of Cordon Blues for details. Male Pin-Tailed Whydahs have amazingly long tails that are used in courtship displays; a video of one in the wild is posted here. 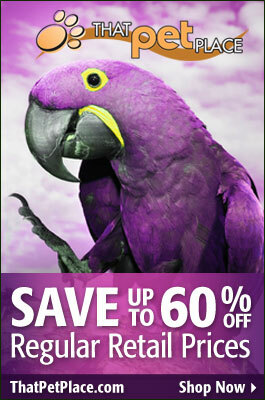 Previous: Sleep – the Key to Teaching Your Parrot New Words and Tricks?